The dominant white version of history declares January 26 to be a day of celebration. However, many people are vague about what it celebrates, or think it’s the date the First Fleet landed in Australia. (That happened about a week earlier.) Some also think it’s a longer-standing celebration than it is. It wasn’t until 1935 that all states marked the day, and the public holiday only got a spot on the calendar in 1994. This day that is apparently so precious to preserve is steeped in confusion for those who insist on preserving it. Historically, January 26 marks the raising of the Union Jack in Sydney Cove in 1788 and the official declaration of British sovereignty. It’s not hard to see why this day, currently celebrated as Australia Day, is a day of mourning for many Aboriginal people who refer to it as Invasion Day or Survival Day. It symbolises the beginning of a disastrous era in which forbears were massacred, enslaved, confined to compounds, had their children taken from them, and came under pressure to assimilate to white folk’s ways. There were at least 270 frontier massacres over 140 years, as part of a state-sanctioned and organised attempt to eradicate Aboriginal people. January 26 continues to be called Australia Day, despite mounting calls to change the date of the national celebration. The entitlement to make this call, to determine which version of history prevails is, Robin DiAngelo argues, the foundation of cultural dominance. Cultural dominance is implicit in comments by Prime Minister, Scott Morrison. Speaking of Australia Day 2019, he referred to a few historical scars and some mistakes, but that we shouldn’t let that get in the way of celebrating “the day Australia’s course changed forever”. Former Prime Minister, subsequently ‘special envoy’ for Aboriginal people, Tony Abbott, was even clearer in his assertion of white dominance. He declared that the arrival of the First Fleet was a “good thing for Aboriginal people”. The dominant white version of history defines January 26 as a day of celebration, thus erasing alternative versions, such as the experience of the day as one of mourning. It recognises the significance of the day in terms of change, but tells those who mourn that they too should celebrate because white invasion was ‘good for them’. I have an inkling of how that might make me feel if I was an Aboriginal person. Politicians lead the way in controlling the conversation to control the date. Another former Prime Minister, Malcolm Turnbull, described local Councils that “turned their backs” on January 26 as “utterly out of step with Australian values”. He banned Councils that decided not to have citizenship ceremonies on January 26 from having them at all. Scott Morrison mimiced this approach in his message to “rogue councils intent on playing politics with our national day”. As if, Prime Ministers, there is some universally agreed set of Australian values! And, as if the insistence on celebrating January 26 is not in itself “playing politics” in a particularly divisive and hurtful way. It’s not that the specific date seems all that important to many white people, but asserting the power to determine the date is an ‘entitlement’ many want to retain. Blame James Cook. Blame the King. Blame the British monarchy. Don’t blame the Australian people. We aren’t responsible for what happened 200 years ago. We aren’t responsible for our forefathers. The government has acknowledged and apologised on their behalves. I did not do these things and to blame me is wrong. I am an average Australian. Nobody alive today should wear the responsibility for what happened when Europeans came. These responses might as well come with shouty capitals about not wanting to know, demands to be left in peace, and appeals for attention to the hurt feelings of white people who weren’t even there when the invasion happened. Spare a thought for ‘poor us’, they implore. We’re upset at feeling blamed for something we didn’t even do. It was like that when we got here. It’s not fair. So over this stolen land etc. I know I’m at risk of being trampled by some social justice warriors, but referring to Australia Day as ‘invasion day’ is nothing but a whinge and will accomplish nothing. We can either continue bemoaning what happened over two centuries ago, or we can accept it for what it is, an unfortunate part of our history. They are always going to have a cry over this. Go Australia. There are 22 days every year that celebrate aboriginal culture. Check it out. Really guys, can’t we have 2 days without all the bleating. 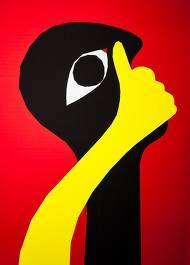 Telling Aboriginal people to ‘stop complaining’ is another version of ‘I don’t want to know’. The tactic is paternalistic and infantilising. Ask any child. They deal with it on a daily basis. We’re sick of your grizzling, these comments declare, and we have a right to tell you so. Probably for your own good , so that you’ll pull your socks up and appreciate what you have. 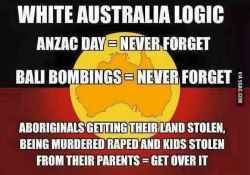 Aboriginal people and their ‘complaining’ are turned in to the problem, deflecting attention from the impact and ripple effects of white invasion. I want to celebrate a day when I’m no longer the white minority of this country. We didn’t invade you. We came here in chains and were treated appallingly. We’ve worked hard to build our country with its easy going culture. This should be respected. I’m just another Aussie battler. So what. Spare some thought for us, these comments demand. We’ve been badly done by too. At the same time, look what we’ve managed to achieve with all our hard work. Don’t tell us your problems. We really don’t want to know. What is it about that you don’t get?! Grow up and let it go. Stop living in the past, move on, and enjoy this beautiful country. Many of us have been wronged in some way in our life in the past, but we move forward. 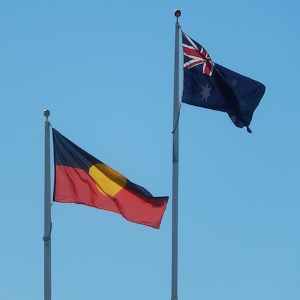 Aboriginal people need to do the same. It’s time to draw a line. We would not, it’s sometimes pointed out, be likely to make such ‘get over it’ comments to survivors of other forms of gross violence – the holocaust, child abuse, war, for example. Imagine, if these things were said on Anzac Day! So, why are such comments directed at First Nations people? Could they be defensive reactions to our collective shame for the damage and destruction barely named let alone addressed? My own awakening about some of the realities of Australian history, which began when I was already of ‘mature’ age, was sick mute shock. I was, for example, stunned by the Bringing Them Home report (1997), and horrifed to realise that removal of children from their parents was explicit policy during my own insular childhood in mid-twentieth century Australia. Rabbit-Proof Fence (2002), the story of three stolen girls who escaped from their domestic placement in 1931, is seared into my memory. The learning is not easy. I know from my own experience. The urge to deny or sanitise unpalatable truth is depressingly predictable. But, for those whose truth is denied or minimalised, such responses are deeply inadequate and unacceptable. Time to assimilate aboriginals into the 21st century or take away all the handouts and let them go naturally extinct. The problems are largely due to race. If they looked the same, many would find it easier to connect and not judge. They need to accept that the country is no longer theirs and move forward into future as one Australia. We learn from history and hopefully move forward building a more tolerant society. I guess some people just aren’t ready to move forward. Maybe it’s healthier to focus on forging a new future and not dwell on misgivings about the past, real or perceived. Whether you like it or not, the fact remains that we must all accept circumstances for what they are here and now, and work to improve things for our future generations. As for the present day inequality and injustice, let’s work together and overcome it. If one side of the equation continues to be retrospective and acts as the victim then nothing will change. The first couple of comments under this heading say it all really. The invitation is to follow white folk into an assimilationist future. The “more tolerant society” on offer is, presumably, one that will ‘tolerate’ Aboriginal people, but only if they stop wanting to name historical injury and injustice, and only if they ensure that white fragility is not threatened by distressing collective shame. The majority of people want to find common ground but also have the right to celebrate the date that is acknowledged as their country’s beginning. To change or rename the day is not Australian but selfish. It symbolises the day Australia essentially started from fresh. No one has ever owned this land and no one ever will. I celebrate that we all are able to share this land. I enjoy Australia Day for what it is. A chance to mix with other Australians regardless of creed or colour. Good people who look out for their mates. This is a day to celebrate being Australian. We all need to compromise and live together. In various ways, these comments assert the dominant culture’s right to decide what January 26 means, and to define it as a day of celebration. So, get with the program, get rid of the mourning, and join the barbie! All of these knee-jerk reactions, straight from the heart of white dominance, create barriers to listening and learning. They control the conversation by shutting it down, intentionally or not. They tell how it is (we are not responsible, stop blaming us, it’s not fair), and how it should be (you need to get over it, and accept our offer to share, on our terms). They fail to challenge the white version of history, or to engage in conversation about alternative versions. It’s hard to respond to such comments in ways that shift the conversation in a constructive direction. At the same time there’s little point in simply telling people they’re exercising white dominance. If people don’t ‘get’ structural power relations and their implications, how do you facilitate new ‘vision’, cleared of white filters? Even, I’ve noticed, people who might consider themselves white allies, who agree that calls to change the date need to be seriously considered, almost always have their own ideas about what date would be a good one to replace January 26 as Australia Day. Are they missing the point? I think so. At least, if we want to have genuine conversations. Nominating an alternative date, one chosen by white people, is still an expression of white dominance. Can we do better? I believe so. But, it is work. And, it’s likely to be painful. Like thawing from ice, as Caitlin Prince puts it. We need our best selves on-task if we’re to shed the cocoon of white dominance. I think the starting point is to take a step back, and think about what it means to listen. Really listen. Deeply. Stepping outside our own frames of reference. The Uluru Statement from the Heart can provide a roadmap with its call for truth-telling. Hearing the truth about white treatment of First Nations people is uncomfortable to say the least. Doing so without defensive denialism and paternalistic whitesplaining is a big hurdle. I’m not optimistic about the chances of political leadership. 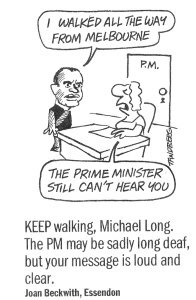 My title for this article harks back to 2004 when Michael Long took his Long Walk from Melbourne to Canberra (over 650 kilometres) to speak to then Prime Minister, John Howard, about the status of Aboriginal people in this country. Howard subsequently, in 2007, introduced his ill-considered Northern Territory Emergency Response intervention. More recently, in 2017, then Prime Minister Turnbull responded through similar white filters to the Uluru statement. We, the people, need to orchestrate our own Long Walk. One that revisits the journey from 1788 and provides direction into a healing future. 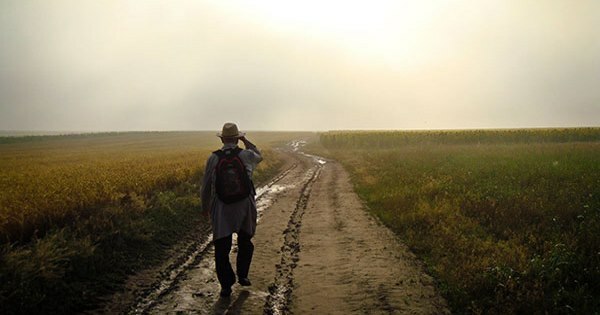 To navigate that journey, white folk need to walk beside and with, not in front of, First Nations people. It’s a long walk from 1788 to January 26, and it’s hard ground, but surely essential for the health of our national psyche. NOTE: If you like this post, you might find others of interest in the category on Race and Racism . Additionally, the Favorites category brings together posts from across all main categories and provides a sense of the scope of this website and blog. Great article, a must read!. I’ll happily pass on to my friends who will truly appreciate the honest perspective and insight to my heritage. Thankyou. Many thanks for your feedback. Much appreciated. Any ideas you/your friends have about how white dominance could be challenged at the grass roots (via, for example, social media) would be much valued. A brilliant article. Spot on. A must read.